And turn every walk into a workout! Nordic Walking is a full body workout that provides fast results. To experience just what it could do for you we have 3 ways to get started depending on your goals, fitness level and whether you have experienced Nordic walking before. These courses are delivered by participating Instructors right across the UK. Find a Nordic Walking UK accredited instructor, delivery partner or Nordic Walking class in your area. 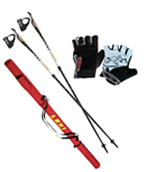 With a wide range of products that include starter packs, nordic wallking and trekking poles and lots more.